"The No. 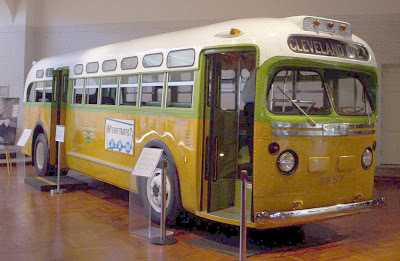 2857 bus on which Rosa Parks was riding before she was arrested (a GM "old-look" transit bus, serial number 1132), is now a museum exhibit at the Henry Ford Museum." Photograph is courtesy of Wikipedia. Today is the anniversary of the births of two activists who influenced our thinking and our lives, Rosa Parks, an African American Civil Rights activist, recipient of the Congressional Gold Medal and Betty Friedan, an American Feminist, activist and writer. When I think of equality, I think of these two Americans. Thank you for the reminder! I teach women's studies at a local university so am always happy to see these women's history brought forward. What interesting careers you both have. And I would love to just visit the Henry Ford.